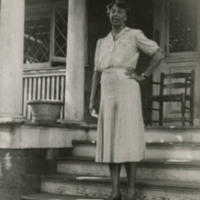 Photograph of Eleanor Roosevelt standing on a stoop. Her hand is on her hip and she is looking sideways. 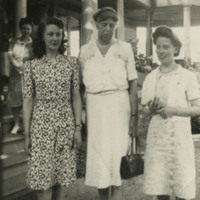 Several students appear in the background. 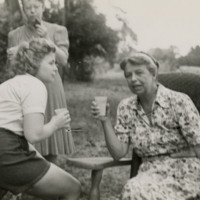 Photograph of Eleanor Roosevelt with a student and others looking on in the background. Both Roosevelt and the students are seated in chairs on the lawn and sipping a beverage from what appears to be a plastic cup. 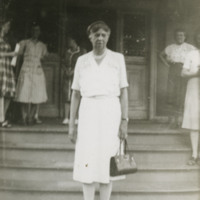 Photograph of Eleanor Roosevelt standing on a stoop. Her hand is on her hip and she is looking sideways.